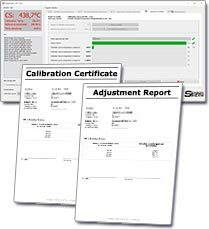 With calibration sources the accuracy of your pyrometers can be checked. Highly accurate results can be obtained in conjunction with one of our Transfer Standard Pyrometers. For calibration of radiation pyrometers up to a temperature of 1500°C. The CS1500 is preferably used for the calibration of the short-wave silicon or indium-gallium arsenide pyrometers. Pyrometers with longer wavelengths detector also can be calibrated using the comparison method. With the cylindrical cavity having a conical end of silicon carbide, a very high emissivity is reached. Six radially arranged rod heating elements heat-up the cavity to temperature and enable a very high temperature uniformity and heat flux. The built-in PID controller allows for a heating time of about 40 minutes up to 1300°C and a control accuracy of +/-0.5°C. Stability: < 0.5K over 30 min. Small calibration source for the calibration of radiation pyrometers in the laboratory or on site at the plant up to a temperature of 500°C. Diadem transfer standard pyrometers (TSP) are highly accurate and long-term stable pyrometers that are used for comparative measurements between the TS pyrometer and the pyrometer to be tested. Subsequently, the TSP temperature is transferred to the pyrometer to be tested. Diadem pyrometers are traceable to the international temperature scale ITS 90, they are calibrated with PTB-calibrated reference devices and adjusted. Of course Diadem pyrometer can also be used for normal measurement tasks, which require very low measurement uncertainty and high reproducibility.